On the empty streets of Shimbashi, a district of Tokyo, at about half past 11 on a Friday night, a few elderly women promote massages, and some young men in suits stand out front, doing very little to promote their suspicious and empty establishments. But Tanuki sits packed. Inside, two men from Hokkaido, Japan’s northern island, work chopsticks up the spine of a fried whitefish and then snap at salted pods of edamame as cold Kirins tower above stacked and emptied plates. 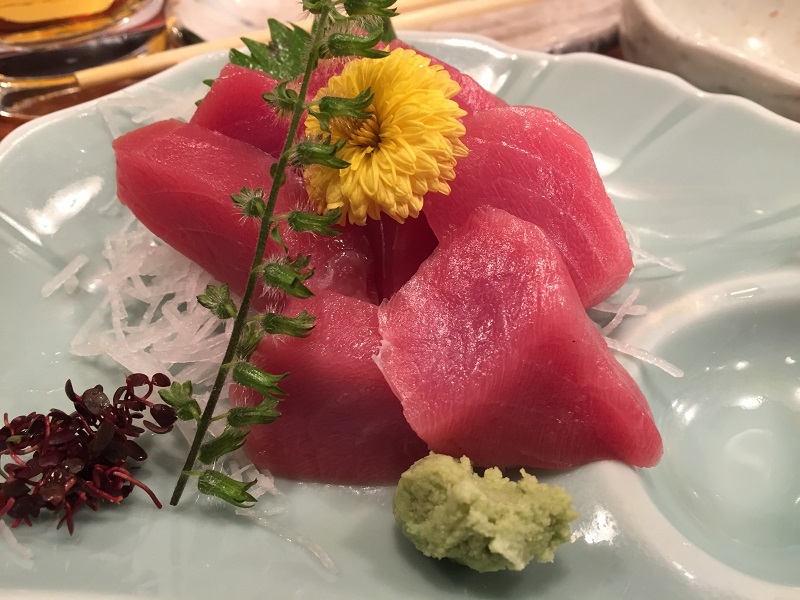 A few seats down, a primary school teacher and her friend capture ruby squares of tuna between their wooden utensils, deconstructing the cubed pyramid built atop a peppery shiso leaf. Their Kirins sweat with the summer heat. And three women, all seated on tatami mats laid on the floor, work mollusks out from turban shells, breaking only to sip their Kirins. 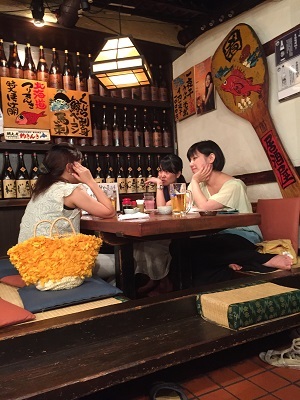 Across Japan, this is a typical scene at the izakayas, which are similar to American pubs, except that at izakayas food is probably more integral to the experience than the beers. Unlike American pubs, many of which would have a hard time passing a health inspector’s exam after the slop of happy hour left the place in shambles, izakayas, even the dingy ones, speak of class. Red lanterns are usually strung out front like classy beacons. Instead of sports posters or trite beer jokes nailed to walls, Japan’s izakayas are often adorned with beautiful sheets of calligraphy (even though it’s just the menu). The food, served as small dishes like Spain’s tapas, is artfully presented. 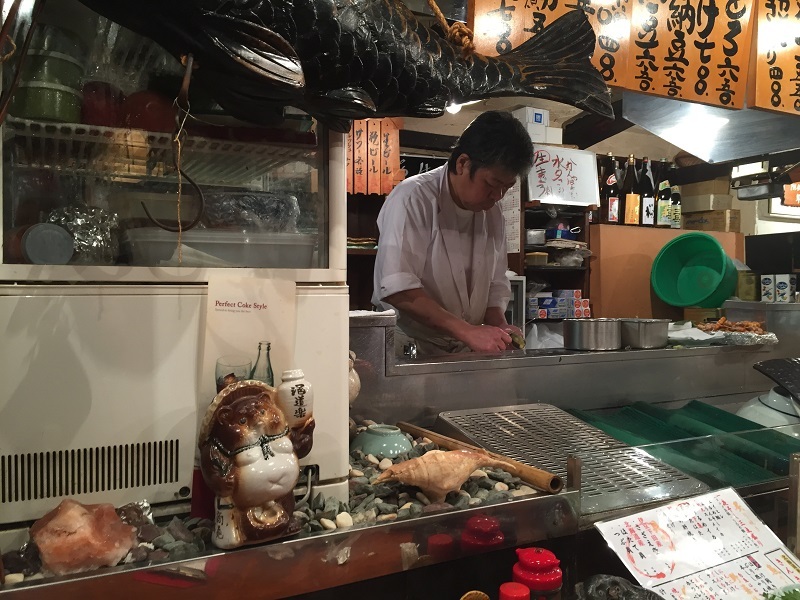 And at the better establishments, like Tanuki—named for the raccoon dog, a creature that represents prosperous business in Japan and is less associated with garbage-tipping and rabies than is the American raccoon—the chef stands before his patrons, delivering pride and finely crafted otsumamis, which means small dishes. The only thing universal among American pubs and Japanese izakayas, besides the beer, are the bad beer advertisements still taped to the wall that appear to have survived the 1980s. While many readers might have already pictured a perfect scene, so long as craft beer lines the taps or refrigerator shelves, this is where things crumble. For some reason, Asahis and Sapporos and Kirins make up the lion’s share of the offerings. 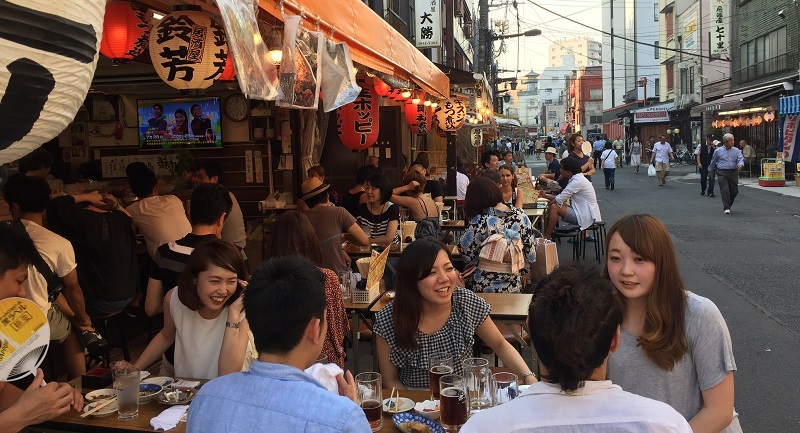 Even at the few dozen izakayas on Hoppy Street, where tables are tucked away behind paper lanterns and bamboo screens, west of the heavily touristed temple in Asakusa, these three breweries are the feature on this road. In fact, move about the country, and unlike a journey through a few states, where local craft beers give character to a bar, in Japan, it’s often the familiar three. “Do you have any craft beer?” one might ask. There are microbrews, like Shimaguni Stout or Coedo Brewery’s IPA, served at izakayas. But they are a harder find. At the very least, while the beer menu is a bit slim, the options for food and type of izakaya (for instance, Tokyo has a few dozen that have been awarded Michelin stars and thousands less concerned with accolades) feel endless. In Kyoto, drinkers down the bustling alleys of Ponto-chō pair Sapporo with yudofu, the city’s famed tofu cooked in broth. Up in the mountain region of Takayama City, where Hida beef is a prime offering, the quiet and austere izakayas partner cold Asahis with whole roasted heads of garlic and with potato croquettes, which are speckled with the well-marbled beef. Hide Hiyashi, a native of Takayama City, recommends some other local dishes from his prefecture, like keichan and hoba miso, a chicken and vegetable dish and a fermented soybean paste grilled on a magnolia leaf, respectively. A local man from Tokyo named Toru says that he prefers tender chicken yakitori, which he presents on a pair of silver skewers. While it might be more “crap beer” than craft beer at the izakayas, at least the little treats that arrive on plates and the pride of the chefs make these big-brand beers go down a whole lot better, making a trip to Japan’s izakayas as wonderful as any pilgrimage centered on beer. Noah Lederman writes the travel blog Somewhere Or Bust. His writing has appeared in the Economist, Boston Globe, Slate and elsewhere. He is completing a memoir about the year he spent surfing the world and outrunning stray dogs. He tweets @SomewhereOrBust.